If you’re a fan of the EU and have a hankering for a bit of a stroll this weekend, or if you’re perhaps just a tourist looking to see a bit of Copenhagen, there are plenty of options on offer. 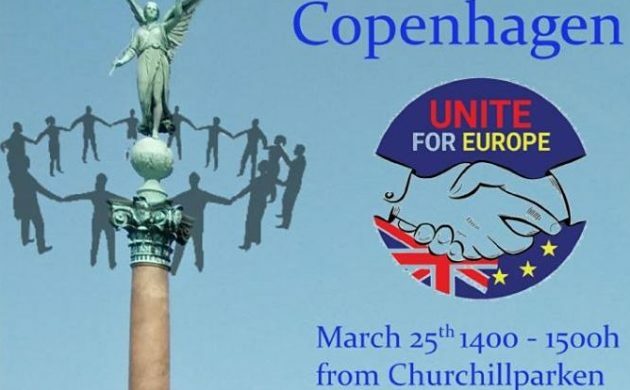 It all kicks off on Saturday, when the Copenhagen Unite for Europe march starts at the statue of Winston Churchill in front of St Alban’s Church and heads along Langelinie (the Little Mermaid is there! ), eventually ending up at the British Embassy. The march is scheduled in opposition to the UK government’s intention to trigger EU’s Article 50 by the end of March 2017, as stated by the British prime minister, Teresa May. “We can embolden our elected representatives. The vast majority of British MPs support our membership of the European Union, but are being railroaded into a catastrophe by reckless and incompetent leadership,” the Copenhagen Unite for Europe organisers told CPH POST. The Copenhagen Unite for Europe march is a sister march of the Unite for Europe March taking pace in London on the same day, which incidentally marks the 60th anniversary of the signing of the Treaty of Rome, which established the European Economic Community in 1957. Then, for those still in the mood for a good stroll, on Sunday the Pulse of Europe movement is organising a march in Copenhagen to encourage future European co-operation. It starts at Europahuset on Gothersgade 115, the EU headquarters in Denmark, and finishes at the Parliament building.